We were there at our liferaft service and checkup so we got to see the contents and sit inside the pathetically small space. We felt it was just ok for us two and yet it is a four person raft... we could not imagine four grown men in here for any length of time! 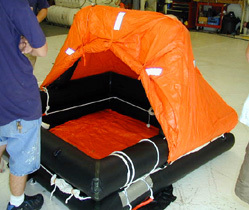 It is an extremely sturdy raft having a thick outer tube and separate inner tubes. There was no sign of damage anywhere and to us it looked brand new. 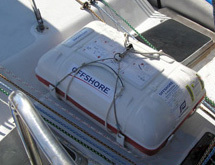 The picture below shows the contents included with the liferaft. There is also a blow up of the hand-held water maker which was also serviced at that time back in 2002. Contents include - flares, first aid kit, oars, pump, repair kit, water, food, light sticks. The life raft is mounted on deck, just aft of the mast.